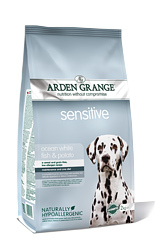 Arden Grange Sensitive Ocean White Fish and Potato is a nutritionally complete dry dog food which is ideally suited to dogs susceptible to digestive disorders and skin irritations. Ocean white fish provides a primary protein source that is easily metabolised for efficient bodily functioning. Completely cereal and grain free , Arden Grange Sensitive dog food provides all breeds of dog with a hypoallergenic wholesome diet full of natural goodness. Potato as the carbohydrate source ensures a sustained energy release throughout the day providing all dogs with the health and vitality they need. An excellent omega-3 : omega-6 ratio may help alleviate inflammation and suppress adverse immune reactions.